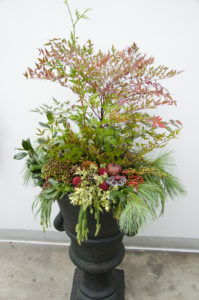 The holidays are the perfect time of year to use traditional plants with non-traditional choices to create unique containers. This allows you to arrange and create awesome looking containers for the exterior or interior of your home. Don’t forget, these creations also make wonderful gifts! Colorful containers flanking your door can make an impressive and welcoming statement. It can also direct the flow of traffic to the door you prefer people to use. Depending on your space, you can use either one or two containers. One of my favorite combinations is an evergreen tree or shrub like a holly, arborvitae, juniper, or yew in the center of the container, surrounded by cold-hardy pansies and violas for seasonal color. Soften the edges of the container by adding ivy or lysimachia. 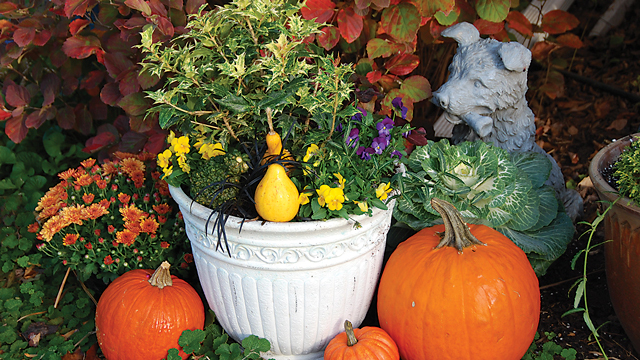 This combination can take on a fall look by adding small pumpkins or gourds tucked in amongst the flowers. Window boxes take on a holiday look by using miniature conifers. Place several different ones in your box to create a scaled-down forest. Decorate your miniature forest with mini pinecones, pumpkins, or berries. Transition into the Christmas season by removing the fall add-ins and replace with red berries, ornaments, garland, and miniature lights. Create a unique combination by adding living and non-living things. If you prefer a non-living arrangement in your container, some of my favorite things to use from nature are evergreen boughs, cuttings from a red-twig dogwood, pinecones with a glitter finish, magnolia leaves and cones, and dried seed pods. I have also been known to throw some cranberries in to create a winter theme. For some height, add corkscrew willow. You might also decorate a living tree for the holiday season. The dwarf Alberta spruce is a great choice for an outside container. Inside, use a Norfolk Island pine. Simply winding tiny sparkling lights around the plants turns them into Christmas trees. It is a common sight in my garden to see a potted deciduous tree like a Japanese maple showing off with its bare limbs covered in glittery ornaments and lights. An arrangement for a centerpiece on a table or mantel can easily be made using succulents, foliage plants and traditional holiday poinsettias. Whether it is a gift or for your own home, the first step is always the same: Find the right container. It could be anything that holds some potting mix, from an heirloom silver bowl, to a simple woven basket. Succulents offer a variety of shapes and different textures and complement each other in arrangements. They tolerate neglect, but flourish when they receive proper care. Nearly all succulents do well in pots. Visualize a tall sansevieria in a shallow bowl surrounded by a variety of powdery, rubbery, or bumpy succulents. Tuck in some colored green or red moss and you have yourself a dish garden to keep or give as a gift this holiday season. The traditional poinsettia is gorgeous sitting alone on a table, but every holiday season, I pull out my festive containers and create combinations using poinsettias and various foliage plants. The Norfolk Island pine is one of my favorites. It can be decorated with tiny ornaments or bows. It stands tall while small poinsettias surround it. Tuck in a small container of ivy to soften the edges. A small African violet can also add some color. Cover the soil with moss for a finished look. Keeping plants in their original containers makes it easier to change elements or take the arrangement apart after the holidays. Spray broadleaf evergreens with an anti-transpirant spray such as Wilt-Pruf to slow down evaporation of moisture from their leaves. A small spray bottle of room temperature water can be used to keep your succulents alive and happy. On warmer days, water your outdoor containers. Never water frozen plants. Susan Frakes is a certified horticulturist in Virginia. Her specialty is container gardening, and she works at at Strange’s Garden Center.